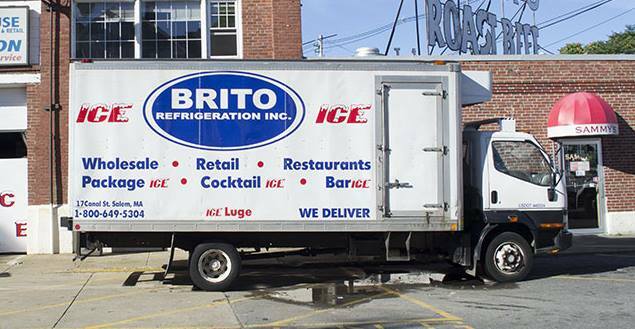 ​​Brito Refrigeration Inc. has been supplying quality ice delivery services for over 14 years, and providing refrigeration services to the Salem, MA and surrounding Greater North Shore area for over 39 years. We deliver ice for all occasions, from small parties to elegant weddings with our selection of 5, 20 and 40 pound ice bags along with our dry ice, ice blocks, and even ice sculptures. and service. Our ice deliveries are great for holidays, parties, cookouts, weddings and more! We also have Luges and ice sculptures available. Brito Ice offers scheduled route deliveries. With our state of the art routing system, we are able to provide superior service giving you, the customer, the peace of mind that you will always have product allowing you to maximize your profits. Our service deliveries are quick and efficient and our response to fulfilling your orders are prompt and complete. Our customers range from Mom & Pop Shops, Connivence Stores, Liquor Stores, Pharmacies, Supermarkets, Grocery Stores, Gas Stations, Caterers, Event Planners, Hotels, Night Clubs, Farms, Marina's, to Yacht Clubs and more. Major chain stores include 7-11, Walgreens, CVS, RiteAid and Richdale Convenience Stores. We offer 7 days a week emergency ice orders for all your ice needs. Our full fleet of trucks operate within the Greater Boston area to service all your needs. With an average delivery time of 120 minutes for the Hospitality industry and 24 hours for the Convenient store industry, The Brito Ice can handle all your ice emergencies. We have double door ice boxes that can be delivered to your location that will hold up to 1400lb of ice. The double door box is approximately 78" wide, 34" deep, 75" tall and requires a standard 110V plug. Our refrigerated trucks can hold up to 15,000lbs of ice and can be delivered to your site and is self sufficient with no electricity required. Refrigerators - Refrigerator sales, service and repairs.